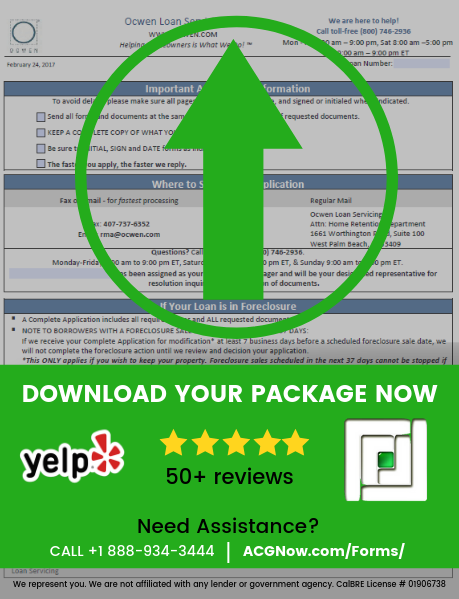 Take the first step to getting started on your loan modification.. Download Forms Here. Why Deal With Ocwen Yourself?! ?Still Dealing With Ocwen Yourself?!? Ocwen Experts Here To Help. FREE Custom Ocwen Strategy Session With An Ocwen Experienced Team Member. What is an Ocwen Loan Modificaiton Package? Ocwen Loan Servicing requires that doing an Ocwen Loan Moification Form or Request For Mortgage Assistance (Ocwen RMA) must be completed as the first step of applying for mortgage assistance. It’s important that you use the latest paperwork. Always check with an expert or your Ocwen single point of contact before applying for help with your Ocwen mortgage. There are few professionals that you can call on that really specialize in the dealing with Ocwen and their process. Working with the right expert to work with is crucial; You should be able to avoid the pitfalls. That’s why we put the latest paperwork we could find online; to help you. That’s what we do is work with homeowners just like you. Click here to request a call from a loan mod pro or call 888-934-3444. What is the Ocwen hardship affidavit? Pro Tip: When reviewing you for a modification approval Ocwen looks for your original reason for defaulting or RFD. If the RFD has not been cured (hardship) has not been resolved in many cases the will not be able to help. First, let’s go over what a modification is not. A loan modification (or loan mod) is not a refinance. The definition of a refinance is when you get a new loan to pay off your old existing loan or combining loans. You cannot combine loans, such as a first and a second mortgage, when you are completing a loan modification. A loan modification is exactly as it sounds. We work with you to change the terms of the loan that currently exist. This is the banking industry and thinking outside of the box is just not what they do. So there are limitations to the things you can modify on your loan and how those things can be modified. The number one thing people talked to us is about changing their interest rate. While this is important it’s not the only way to adjust the payment. The mortgage servicer will push to reach affordability to it will be based on your income. The life of the loan may be adjusted to reach affordability but it doesn’t work the same way as many times people say they are adding the payments to the back of the loan. The loan isn’t physically extended by the number of payments you miss. In many cases the loan is extended back to 30 years or even extended further out. We have seen as much as 50 years, but as 30 years is the norm, any extension beyond is generally no more than 40. This is completely controlled by the beneficiary of the note and the limitations they set. Principal capitalization is when they take the amount you are behind on, including any past due payment, interest, and fees later adding them to the outstanding balance of what is owed. In rare cases that are generally dictated by the amount of perceived equity in the home (or lack there of) the investor on the loan may be willing to take a reduction on the principal owed. Getting Your Forms Submitted To Ocwen To Get The Process Going. What is in the Ocwen Loan Modification Package? Most servicers, not limited to Ocwen Loan Servicing LLC,have the same typical requirements. The loan servicer will require you to provide your financial information such as a monthly budget, your tax returns for the last two years along with a 4506t to show the returns were actually filed, pay stubs or proof of income like a profit and loss, bank statements, reason for requiring to do a loan modification, and a hardship letter. Pro Tip: Working with our professionals should allow you to be able to pick out the documents your servicer Ocwen will need. When your mortgage company requests items after they’ve started their modification review process they passed over sending your file to the next stage. In order to complete a loan modification a loan servicer such as Ocwen Loan Servicing LLC balances the options available to a homeowner on many different factors. One of them is whether the value is acceptable to them and they do this by completing a value. There are different types of values including those done online. In some cases a value is completed by a real estate agent, also known as a Broker’s Price Opinion (BPO), who reviews the comparables in the area. They may ask to gain access to the home which is referred to as an interior value. In some cases a drive by or external value is completed. In any case, they review the properties that are currently listed but more importantly they review the properties that are sold generally within the last 3 to 6 months. They consider the homes perceived condition, the size of the living space, the size of the lot, how many stories it has and whether or not it has a pool. They will also consider market conditions and how fast homes are selling in the area. There are many factors they take into consideration. In some cases the mortgage investor behind Ocwen, the actual beneficiary of the note, will require a value to be completed on the property before approving any loan modification terms. The bank for this part of the process will generally do an automated value module or AVM. This is a computer generated value. Due to the prohibited costs involved, when you’re servicing thousands of loans, they rarely hire a local agent or broker to do a value referred to as a BPO or Broker’s Price Opinion but it does happen. In even rarer cases the beneficicary will pay for a by a licensed appraiser. In some cases the homeowner has to pay an upfront fee for such values to be completed. Every so often the value will come in wrong. Maybe it comes in too high… Or maybe it comes in too low. What do you do when you property value is off? This can happen to anyone. Doesn’t matter if you’re a professional, even if you’re a layman, you may have to deal with a value dispute. Depending on who the investor is or if it’s insured there may be different processes for filing disputes with Ocwen or another managing entity. Ocwen’s Net Present Value or NPV Process and Analysis. Once the value has returned and they have a complete package this is where Ocwen’s short sale negotiator or underwriter will make a decision if you meet the minimum criteria to be submitted to management or the investor for approval. Usually there is an auditing process before the submission to management and if approved there is often another auditing process the occurs before an approval letter is issued. NPV stands for Net Present Value. It’s basically an algorithm for the value of money to the investor. This isn’t a stable value either. It changes from day to day. The NPV is the concept of looking at two separate borrowers and establishing where they believe they would make more money. As in most cases people are behind when requesting to modify their loan and as such the lender has to decide whether taking the amount they owe and increasing their balance is worth it to them. Homeowners have to know that when the numbers don’t add up for the investor that is when they are most likely to get declined. The only way to counter a NPV is by looking at the ingredients that make it up. You have to attack the parts that don’t make sense. Look at each field and decide what you believe should be the input. The most typical are incorrect income figures but it could go beyond that to things like the property’s perceived value and even in some cases the consumers credit report. In most cases, should you be approved by Ocwen for a loan modification they will put you on a three month trial plan. You will not know what the finalized terms will be that they are offering you but the final payment should be inline with what you will be paying for the mortgage at least at the onset of the new plan. When your loan modification is being completed with Ocwen there is a finalization process. If you’re on a trial payment plan somewhere after the second payment and before the third payment the finalized loan modification documents are sent out. They usually come with a prepaid package to return the documents to the lender. Once the documents are returned and the loan modification goes through the final audits with underwriting the master loan documents are amended to show the new terms of the loan. We've Been Dealing With Ocwen For Over A Decade! ?Don't Get Lost In Ocwen's Web!? 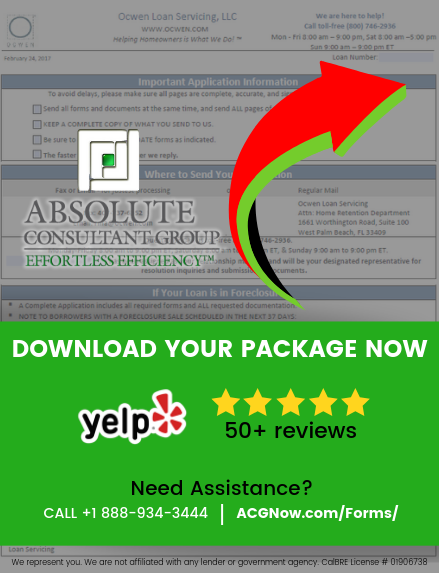 Absolute Consultant Group (ACG) works with you and your lender to help streamline the process. You get a USA based team that’s here to serve you quickly to get you faster results. We don’t charge up front and only get paid if you get results. If you are offered a modification and decline the terms you pay us nothing. Call for details 888-934-3444. If you’ve called Ocwen Loan Servicing even once you know they are most likely to deal with someone overseas. You may also be aware from the Ocwen Loan Modification Package is lengthy. Ocwen Loan Servicing LLC hasn’t simplified the process to make it easy but that’s why ACG is here to offer you to assist with your application for the Loan Modification process to get mortgage assistance from your servicer that you and your family deserver. Based here in the United States ACG is your go to place to get all the information you need while your account is under review. As your single point of contact you will no longer have to deal Ocwen’s loan servicing department in India. Working with someone stateside streamlines the process and limits the misunderstandings. What is the Ocwen Loan Modification Package? For any Ocwen Loan you’ll be require to provide the Ocwen Loan Modification Package known as the Ocwen Request for Mortgage Assistance (Ocwen RMA). Depending on the investor involved you should always use the most up to date paperwork for your application; Prior to use of any documents we suggest to either speak to Ocwen or check with a professional. The paperwork we last found was put up on the Absolute Consultant Group(ACG) Website. ACG helps homeowners with their Ocwen Mortgage Loan Modification process. There are 19 Sections to the standard Ocwen Loan Modification Package and totaling about 20 pages. Need Assistance With An Ocwen Morgage? Section 3A Modification Package – If you do not occupy the property information. Section 18 Ocwen Mortgage Assistance – Information about deed-in-lieu of foreclosure. Ocwen Is Difficult. Don't Go It Alone. Professionals Standing By.